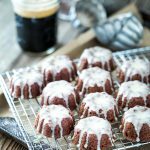 This blog post was sponsored by So Delicious but all opinions are my own. Around this time every year, when the weather starts getting soul-crushingly hot, my body automatically starts rejecting warm meals and yearns to survive only on cold (preferably frozen) food. Recently, I invited a couple friends over for sandwiches. But due to the recent heat, we all agreed that those sandwiches should be of the frozen dessert variety. 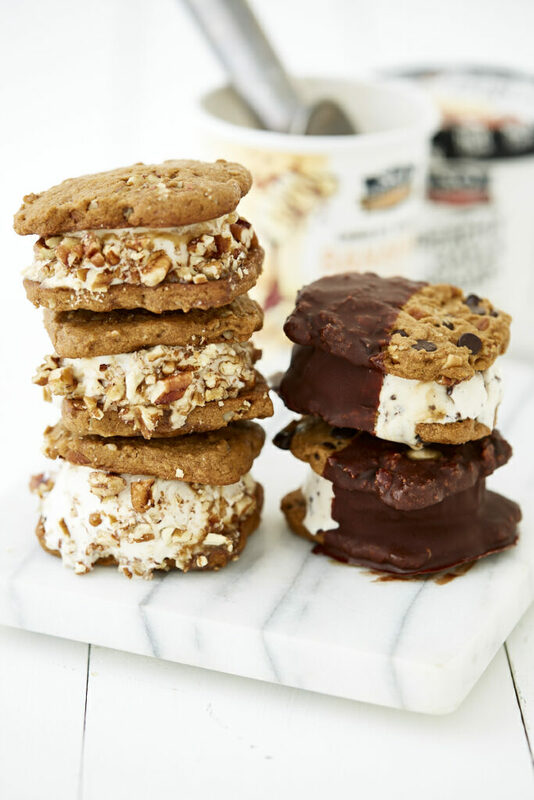 The night before our shindig, we had a group text going, discussing what kind of dessert sandwiches we should have, and it was kind of a toss up between two different types of caramel pecan ice cream sandwiches. 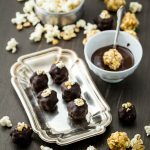 I told them I’d sleep on it and the next morning, when I woke, I knew what I had to do: Find a way to make both AND make it as a dairy-free frozen dessert. First thing I did that morning, after walking the dogs, was make a simple, three-ingredient homemade salted caramel sauce. Then I prepared the cookie dough and popped both the sauce and the dough in the fridge to chill while I went on my run (note: you do not need to go on a run to complete this recipe). After my run, I got down to business. 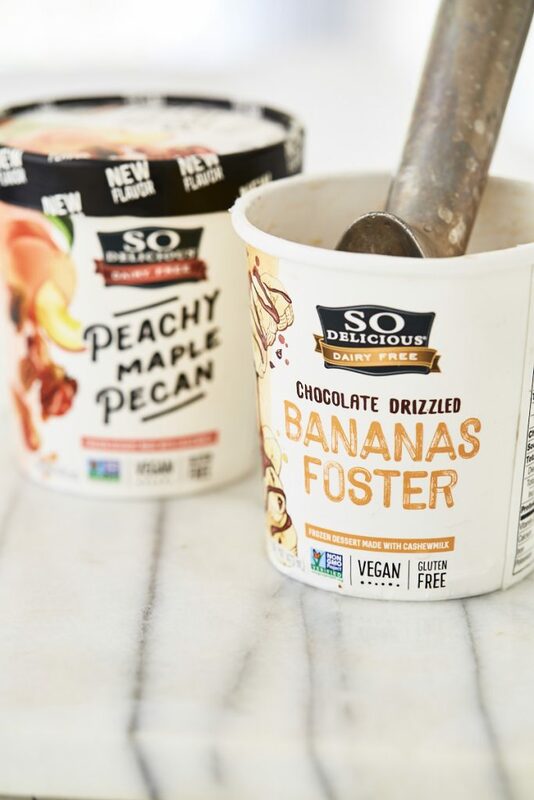 I knew which two dairy-free frozen dessert flavors I was using: Peachy Maple Pecan and Chocolate-Drizzled Bananas Foster, two of the five new frozen dessert flavors from So Delicious. They’re all pretty amazing, and I don’t usually love fruit flavors so that’s saying a lot. The Peachy Maple Pecan has a subtle sweet peach flavor with maple swirls and tiny pieces of pecan throughout. The Chocolate Drizzled Bananas Foster has caramelized swirls flowing through creamy banana with flecks of chocolate mixed in. They’re both rich and heavenly but not overpoweringly fruity. I also really like the Blueberry Cardamom flavor. 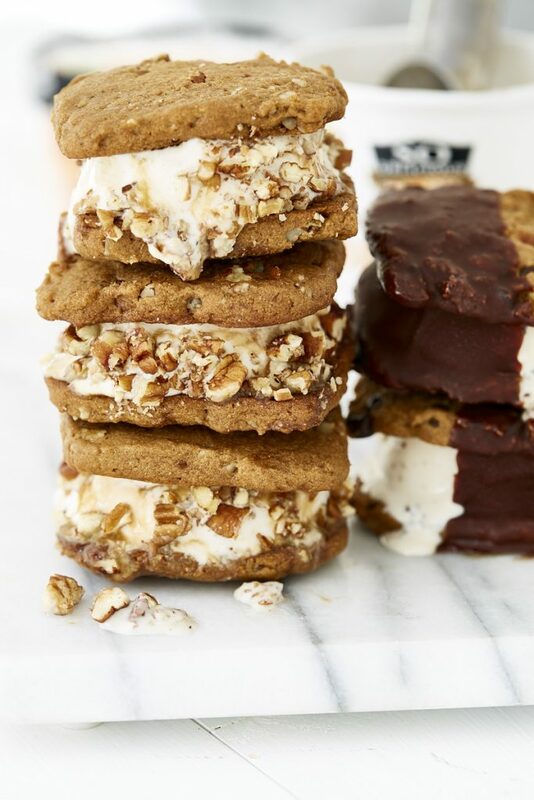 I wanted to keep this “I’m making two different dessert sandwiches” endeavor as simple as possible. So I took that cookie dough I’d made earlier and split it in half. Half of the dough, I kept as-is, and scooped it onto the baking sheets, and shaped the cookies into square shapes (very cute, but totally unnecessary. Circular cookies would work just fine). Then, with the remaining half of the dough, I folded in some chocolate chips. Because WHY NOT?! It’s chocolate!!! Once the cookies had baked and cooled, the task of sandwich-building began. 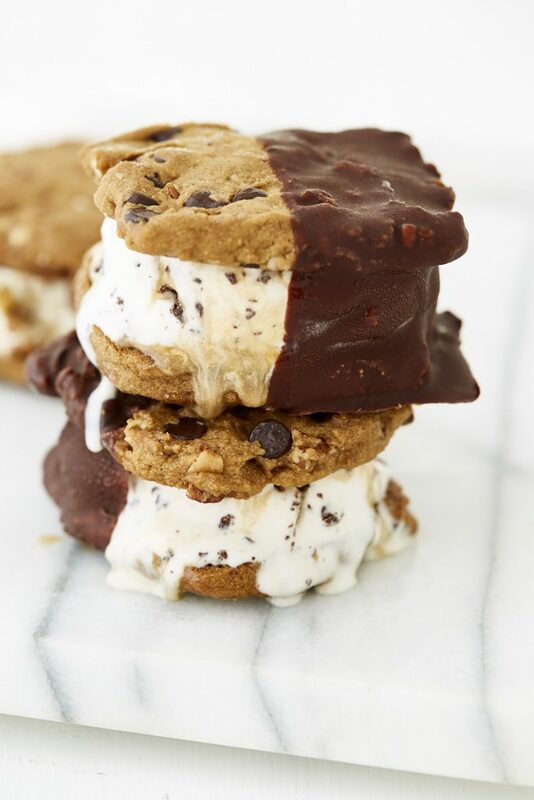 I’m going to stop my story here and offer some advice: If you want to make frozen dessert sandwiches, especially ones you may want to photograph, don’t do it during a heat wave. Or if you do, at least make sure you have air conditioning. Anyway, I plowed ahead in the humid hot-box I call home, sweat dripping from my forehead, as I scrambled to assemble these sandwiches, the pints melting by the second. For the Peachy Maple Pecan, I used pecan cookies, a dollop of caramel sauce, and then after topping it with the other cookie, I smashed chopped pecans around the perimeter of the sandwich and then rushed them to the freezer. For the Chocolate Drizzled Bananas Foster, I used the chocolate chip pecan cookies and the same dollop of caramel. After they froze for an hour, these cookies got the special treatment of being quickly dipped in chocolate magic shell a couple of times before being rushed back to the freezer for another hour. A few hours later, my friends and I were gathered around the dining table, devouring the two different types of caramel pecan sandwiches. We were all astounded by how good they were (even though they’d partially melted during the photo shoot and had been refrozen). I couldn’t decide which one I liked better. I do prefer the Peachy Maple Pecan flavor over the Bananas Foster, though in sandwich form, it’s a toss-up for me. One of my friends preferred the Peachy Maple Pecan sandwich more and the other preferred the Bananas Foster sandwich. Chris only tried the Bananas Foster sandwich and he was a huge fan (and he dislikes the combination of fruit and chocolate altogether, so this was quite a triumph). I recommend trying each of them yourself and then coming back here and commenting with your vote. Or just go to the store and pick up all of So Delicious’s new flavors– Peachy Maple Pecan, Chocolate Drizzled Bananas Foster, Blueberry Cardamom, Toasted Coconut Key Lime, and Cold Brew Coffee. That way, you’re guaranteed to stay cool through this heat! To make the caramel sauce, combine the coconut milk and coconut sugar in a small sauce-pan and heat over medium-high heat. Stir frequently with a rubber spatula or whisk, making sure to scrape the sides of the pot. Once it begins to boil, turn the heat down to a simmer and let it simmer for 15 to 20 minutes, stirring frequently, taking care to scrape the sides of the pot. Once the sauce coats the back of a spoon with a consistency similar to maple syrup, remove the pot from heat. Transfer to a jar and let cool for about 30 minutes before transferring to the refrigerator. Let it chill for at least 3 hours. It will thicken as it cools. In a large bowl, use a hand mixer to cream together the butter (or coconut oil) with the coconut sugar, about 3 to 4 minutes. Once completely combined and creamy, add the aquafaba, vanilla extract, baking soda, baking powder, and salt. Use the hand mixer to blend until fully combined. Add the flour and mix just until combined. Fold in the pecans and chocolate chips. 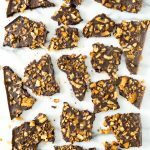 If you're only adding chocolate chips to half the dough (to make both types of sandwiches), fold in the pecans and then split the dough in half and transfer half the dough to another bowl and fold the chocolate chips into one half of the dough. Cover the bowl(s) and refrigerate for at least 30 minutes. Preheat the oven to 350. Line two baking sheets with parchment paper. Scoop 1.5 tablespoon scoops of the dough onto the prepared baking sheets until all of the dough is used. Use your fingers or the back of a measuring cup to gently press the cookies down a little (they'll spread a little bit, but not much). If you want the cookies in any particular shape (like square, for example), use a cookie cutter to help shape the dough into your desired shape. Bake for 10 to 12 minutes or until the cookies are slightly firm (but not crispy). Remove from the oven and let the cookies cool on the baking sheets for about 10 minutes before transferring to a rack to cool. Once the cookies have cooled completely, set up your sandwich making station. Get your caramel sauce from the fridge and give it a stir. Place the pecans in a shallow bowl or plate. 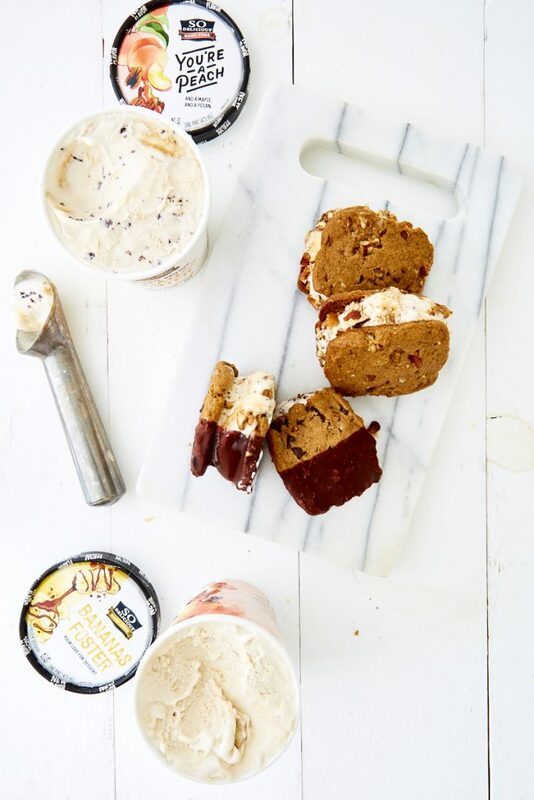 Get your ice cream(s) out of the freezer. Turn one cookie over so the bottom side is facing up. Scoop a roughly 1/4 cup size scoop of ice cream onto the cookie. 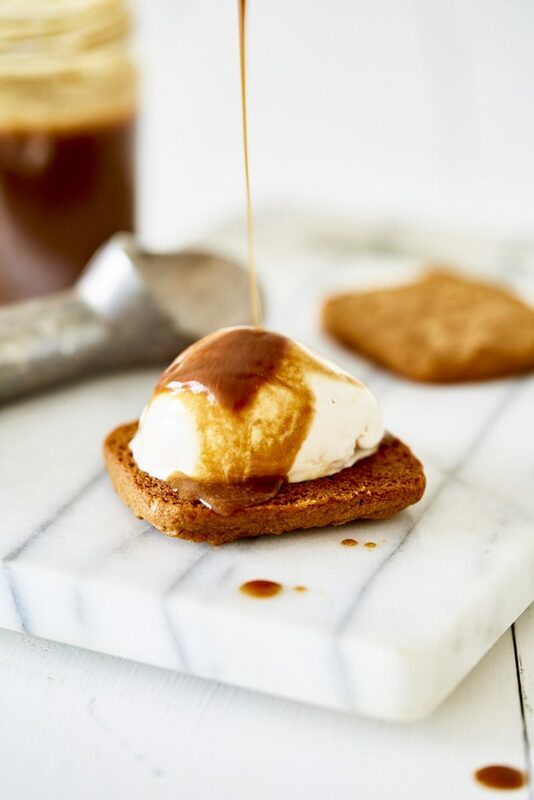 Spoon 2-3 teaspoons of caramel sauce over the ice cream and top with another cookie. Gently press the cookie down until the ice cream spreads to the edges of the cookies. If you're making the Peachy Maple Pecan sandwiches, roll edges of the sandwich in the chopped pecans or use your fingers to gently press the pecans into the edges of the sandwich. Transfer to a baking sheet and repeat until all sandwiches are made. Place the baking sheet in the freezer as soon as you're done. If you're making the Peachy Maple Pecan sandwiches, let the sandwiches freeze for about 2 hours before serving. If you're making the Chocolate-Dipped Bananas Foster sandwiches, let them freeze for 1 hour. Prepare the Magic Shell and remove the sandwiches from the freezer. Dip a sandwich halfway (or more) into the chocolate sauce and return to the baking sheet. Once you've done this once with all sandwiches, repeat the process, re-dipping the sandwich so it gets a thicker coat. Return the baking sheet to the freezer and let them freeze for another hour. If you're not serving the sandwiches immediately, wrap each one individually in foil and freeze until ready to serve. They will keep for about a week. Enjoy! Have you tried any of these new flavors? What’s your favorite? 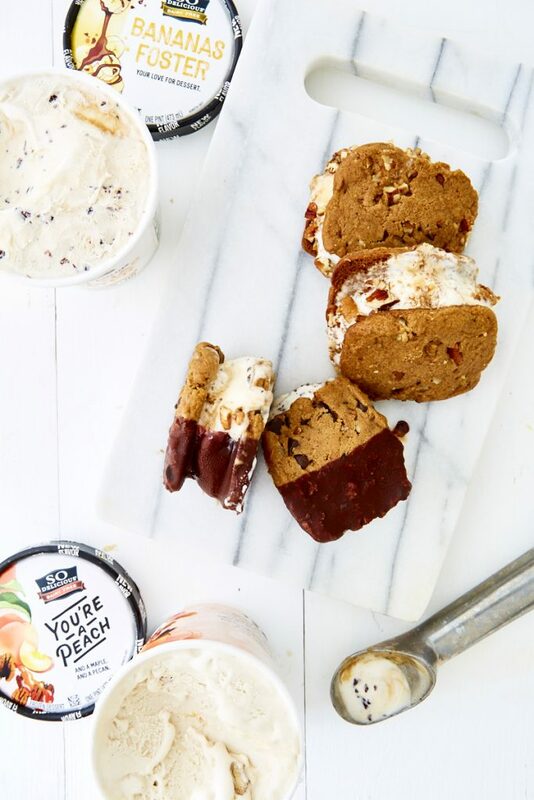 3 Responses to "Caramel Pecan Frozen Dessert Sandwiches, 2 Ways: Peachy Maple Pecan & Chocolate-Dipped Banana"
Those look delicious! I can’t wait until summer so I can these!